Some of the Blackhawks top college prospects were in action again on Saturday night. 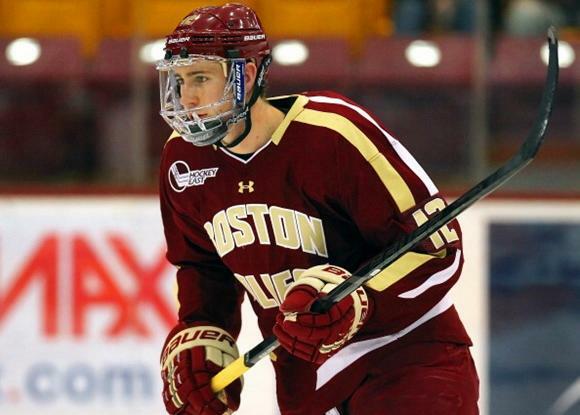 After getting hammered by Notre Dame on Friday night, Boston College rallied to a 4-2 win on Saturday. Kevin Hayes scored one goal and added two assists for a three point night, while Chris Calnan did not register a point in the victory. For the Fighting Irish, both Vince Hinostroza and Stephen Johns were minus-two in the game. Hinostroza scored one of Notre Dame’s goals, though. The University of Michigan defeated top-ranked Minnesota 6-2 on their senior night. Michigan forward Tyler Motte had two assists for the Victors, while defenseman Justin Holl had one assist for the Gophers in defeat. Michael Paliotta had 2 assists in Vermont’s 3-2 win. Dave, TT is coming straight to Chicago, not Rockford…guaranteed. BTW, quietly Paliotta (a 3rd round pick) has had a tremendous season for Vermont and is shaping up as a DMan to watch for the Hawks. I heard somewhere that the problem with putting Kane and TT on the same line is that they both need the puck. And the reason Kane keeps getting put with Zeus is that he can play without the puck – basically he just stands in front of the net. I trust Q, as he knows way more than any of us about the players health, mental space, etc., he’s won 2 Cups and Lots of games, and I tend to be very patient and look at the big picture (i.e. they’re in the playoffs, they are a good team, you have to overcome adversity to win the cup, etc), but I don’t understand how you can continue to play Regin and Zeus. Could Morin be that much worse? Is there some get Morin really pissed and fired up, then bring him up? Why not Sharp at center? I give the benefit of the doubt to the coaching staff, but I’d love to know more about the behind the scenes plan. At the end of one period, its Jokerit 1 and Hameenlinna 1…go Hameenlinna!!! Brad… Handcuffs/Grandpa/Kane line??? 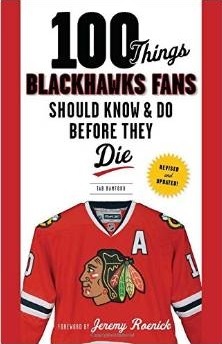 now I know the Kane wants to leave Chicago rumor-may be true!!! Exactly Wall…what about putting Bicks with TT and Kaner??? Your thoughts? Brad – completely agree re: Paliotta. He has been a huge part of UVM’s big improvement in a very tough conference. It will be interesting to see if he decides to sign with the Hawks and start his pro career or whether he returns for his last year of college eligibility. Can someone confirm whether Johns or Hayes would be eligible to play in Rockford if they sign at the conclusion of their respective seasons? It seems to that they will not be eligible since their signing will be after the trade deadline which was similar to Leblanc last year. MS, I think Paliotta is ready for Rockford, but Bowman and Hawks need him to finish out College, because we don’t have the room for more Pro contracts…the limit is 50, so I think he will be back at Vermont…smart, tough player, I like him. What’s up, I want to subscribe for this website to obtain newest updates, so where can i do iit please assist.